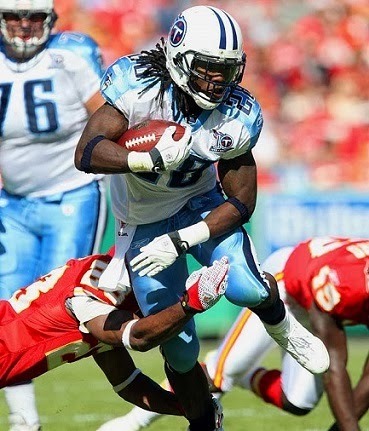 Taken by the Titans in the first round of the 2008 NFL draft (24th overall), Johnson had an outstanding rookie season. He rushed for 1228 yards on 251 carries (4.9 avg. ), caught 43 passes for 260 more yards, and scored a total of 10 touchdowns. His great speed made him especially effective in the open field, and he teamed well with power-running RB LenDale White. It all resulted in his being selected to the Pro Bowl. Titans went 8-8 to finish third in the AFC South while ranking second in the NFL in rushing (2592 yards). While defenses keyed on Johnson, he followed up in 2010 by rushing for 1364 yards and 11 TDs and, with another 245 yards on 44 pass receptions, accumulating 1609 yards from scrimmage. He was a Pro Bowl selection for the third straight year. A lengthy preseason holdout in 2011 led to reduced performance, particularly over the first half of the schedule, although he still rushed for 1047 yards and caught a career-high 57 passes. He bounced back in 2012, running for 1243 yards while averaging 4.5 yards per attempt (his best since 2009) and despite injuries that decimated the offensive line over the course of the season. With 1077 rushing yards and 345 yards on 42 catches in 2013, Johnson’s totals over six seasons are 7965 yards on 1742 rushing attempts (4.6 avg.) and 272 pass receptions for 2003 yards. He has scored a total of 58 touchdowns.